" in the volcano's history. The volcano, known locally as Volcan de Fuego, which translates as 'Volcano of Fire', is an extremely active volcano, and this is the seventh time this year that it has erupted. Guatemala's National Institute of Seismology, Volcanology, Meteorology and Hydrology (Insivumeh) stated that ash has been spread 20 kilometres in east and northeast directions. Authorities have also warned that ash could spread all the way to Guatemala City, the capital of Guatemala, some 50 kilometres northwards of the volcano. Insivumeh warned that "in the eruptive behaviour of the volcano and the variability of the wind, experts do not rule out the possibility that this activity will continue to make ash fall at greater distances". 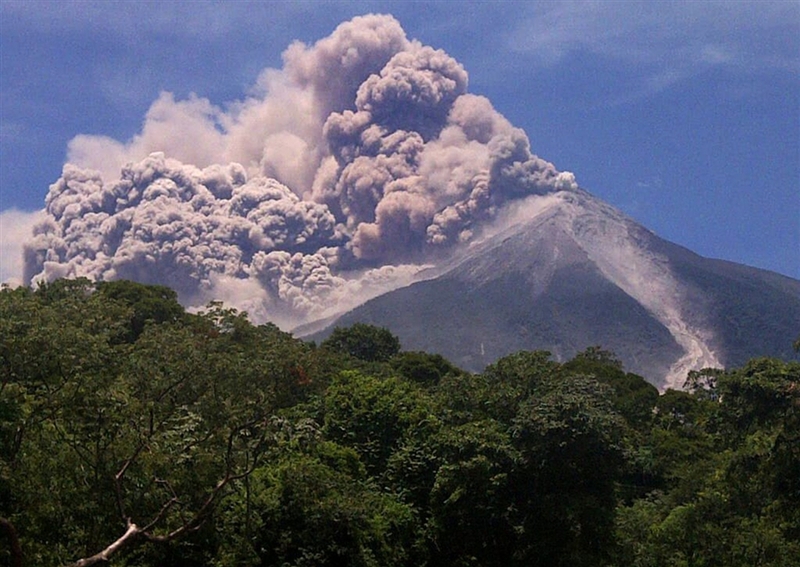 Guatemala's Volcano Observatory added: "These explosions are of a weak, moderate and strong character, expel columns of grey ash at a height of 4400-5,000m (14435-16,405ft) and are driven by the wind at distances ranging from 16-20km to the east, northeast". Authorities have also alerted aviation bosses to warn them about the plumes of ash which could cause travel chaos. The Civil Aeronautics said: "This is one of the largest recorded eruptions of the volcano of Fuego, so it is not appropriate to ascend to any flank of the volcano of Fuego." The 3,800 metre tall Volcan de Fuego is one of South America's most active volcanos, which is some feat as the continent is dotted with them and over 30 in Guatemala alone. This is the seventh eruption of the year, but experts say that this is no cause for concern as it has been blowing regularly since the Spanish conquest.